CD review: "Southern by the Grace of God"
This review first appeared in the July 15, 1988 issue of the San Diego Evening Tribune. 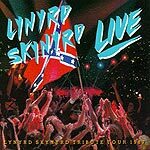 Since the death of vocalist Ronnie Van Zant in an airplane crash in 1977, MCA has marketed various Lynyrd Skynyrd albums drawn from previously unreleased material or re-released material in new packages. The surviving band members have toured under various names, but usually (and most successfully) as the Rossington-Collins Band. Last year, at the urging of Skynyrd fans still grieving 10 years after their loss, guitarist Gary Rossington (minus Allen Collins, recuperating from a serious accident), put together a show of old Skynyrd songs. AS the band had always been vocal-oriented, someone had to fill Van Zant's shoes. His two brothers, Johnny (who leads a band under his own name) and Donnie (who fronts .38 Special) joined the tour, along with patriarch Lacy Van Zant as emcee, lending the show authenticity and making it less ghoulish than it might have been. The music on the record is excellent, if viewed in perspective. This is not meant to be a Lynyrd Skynyrd album, at least not by the participants. MCA found the temptation too great not to package it as such, but the production is true to the goal, with clear references to the missing founder. Like a viewing at a funeral, this tour and album are meant to heal wounds and comfort the living. Charlie Daniels and Steve Morse guest with original Skynyrd members Rossington, Ed King, Leon Wilkeson, Artimus Pyle and Billy Powell. The selection of songs is a veritable history of the band, including "Working for MCA," "That Smell," "Gimme Back My Bullets and "Sweet Home Alabama." On "Freebird," the band's anthem, Ronnie's brothers step aside and allow the fans to sing the entire song with the band. This 20-minute indulgence is the emotional peak of the album, and is appropriately placed by itself on the final side. The audience never misses a transition, and Rossington's distinctive slide guitar sounds as good now as 15 years ago. The musicianship is excellent, if not at quite the same level as Skynyrd itself. But the playing shouldn't be judged for the present, because this album is about the past, about memories.